As a service to our patients, Woodland Hills Dental Group offers various opportunities of payments for treatment. We accept most major insurances PPO, HMO and even some Discount Plans. We also provide our patients with the convenience of paying with cash, VISA, MasterCard or bank DEBIT card. At last but not least, we are pleased to offer CareCredit, the nation's leading patient payment program, we can help you request pre-approval and/ or submit an application. 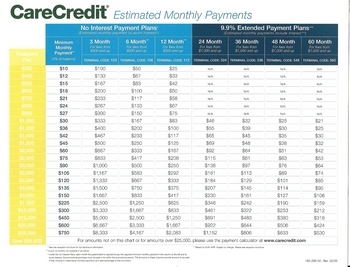 For fees from $300 to $25,000, upon request and approval, CareCredit offers a comprehensive range of plans with low minimum monthly payments that fit comfortably into every budget.